If you need to send orders to Amazon for fulfillment, follow the instructions in this guide. You will learn how to manually send orders to FBA, how to automatically send all orders to FBA, and how to send certain orders to FBA or to different FBA regions. After orders are fulfilled by FBA, the tracking info will be pulled into Order Desk and, in most cases, can be sent back to the original shopping cart. To submit an order to FBA manually, click the Amazon FBA button in the order. If you need to select a specific region to send the order to, based on the shipping country, select the region from the dropdown next to the submit button. Do this before clicking the submit to FBA button. If you aren't using any other fulfillment service and your store only has orders for one FBA region, you can automatically send all of your orders to FBA. To do this, open the Amazon FBA integration settings, which can be found under the Integrations menu in the left sidebar. DON'T WANT TO SEND FULFILLED ORDERS? If you are bringing any fulfilled or historical orders into Order Desk when you initially set up your account, wait to enable this setting until all old orders have imported. Once you are only importing new, unfulfilled orders, this setting can be used to send them to FBA. 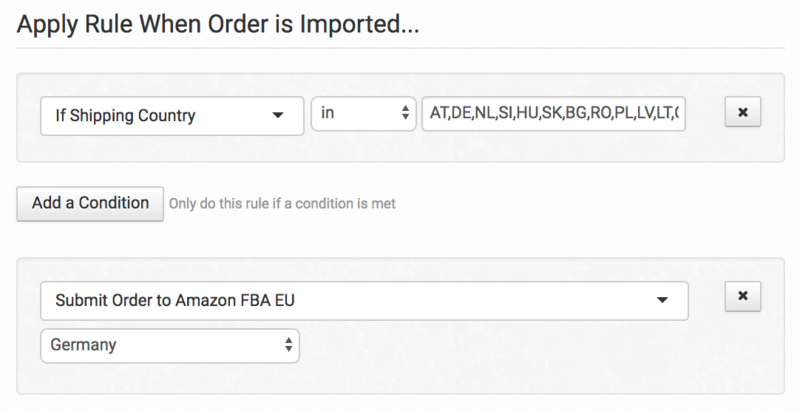 If only certain orders will be sent to FBA, you can tell Order Desk which orders to send by using the rule builder. If you need to split your orders first, to remove any items that aren't meant for FBA, please read the splitting orders guide or the vendor splitting guide specifically for Shopify or BigCommerce stores. Once your orders are split, set up rules to send orders to FBA following the instructions in the next section. But you will need to add any conditions necessary to tell Order Desk which orders you want sent to FBA. This means all Shopify orders will be sent to FBA. This means after an order splits, if the inventory location on the items in the order is FBA, the order will be sent to FBA. The rule builder is versatile and has many options for setting conditions for which orders should be submitted to FBA. Because each store is unique, the requirements and conditions for splitting orders or sending orders will be different for each store. The rules you set up should be customized to your needs. If your products are available to purchase in or be shipped to multiple international regions, you will need FBA for each of those regions. If an order has an American address but is being submitted to FBA EU Italy, FBA will not accept the order because that warehouse region doesn't ship to America. The order will need to be submitted to the FBA NA (North American) region. 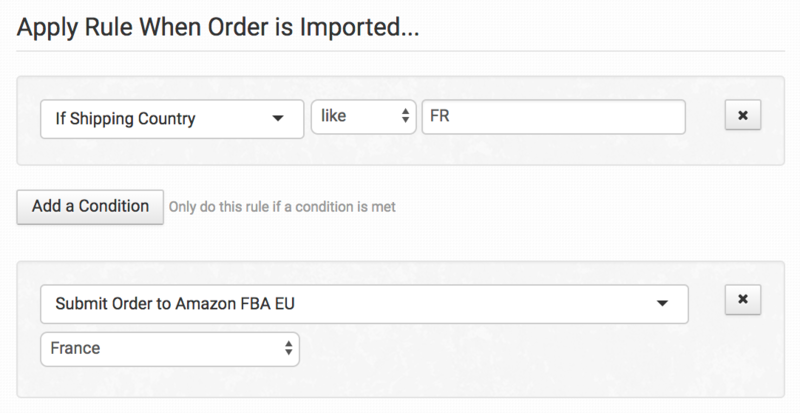 Using the Rule Builder, you can submit your orders by matching the shipping country on the order with the correct FBA region and integration. You can further specify this to include all the countries in a specific region with your condition by using the operator "in". This means if the shipping country on the order is in the list of country codes, submit the order to FBA EU Germany. Amazon FBA EU has a different sets of countries that they ship to depending on which export plan your account uses. Check your FBA account settings at Amazon if you are having trouble submitting European orders to FBA EU. For a list of country codes, scroll down to the EU Country Codes section. If you use separate Order Desk stores for your separate shopping carts and/or FBA regions, you can copy orders from one store to another to submit your orders to the appropriate FBA integration. Orders in the store with the right FBA integration can be sent using rules as described earlier in this guide. If the FBA integration your orders need to be sent to are in a different store, copy your orders from your primary store to the other store with a rule. You might want to include a second action in this rule to move the order to a different folder in the primary store, such as Prepared or a custom folder, to hold copied orders waiting for fulfillment. For more information on copy orders between stores, see this guide. In the second store where orders are being copied to, create a rule to send those orders to FBA. If you use FBA in Europe, you will likely want to send orders to the different FBA locations based on the shipping address in the order. You can use these country codes to make setting up your rules easier, but please check your Amazon account directly if you have any question about which countries FBA will ship to for you based on your account settings. Can I send Shopify orders to any FBA region? Yes. Order Desk supports every international FBA endpoint. 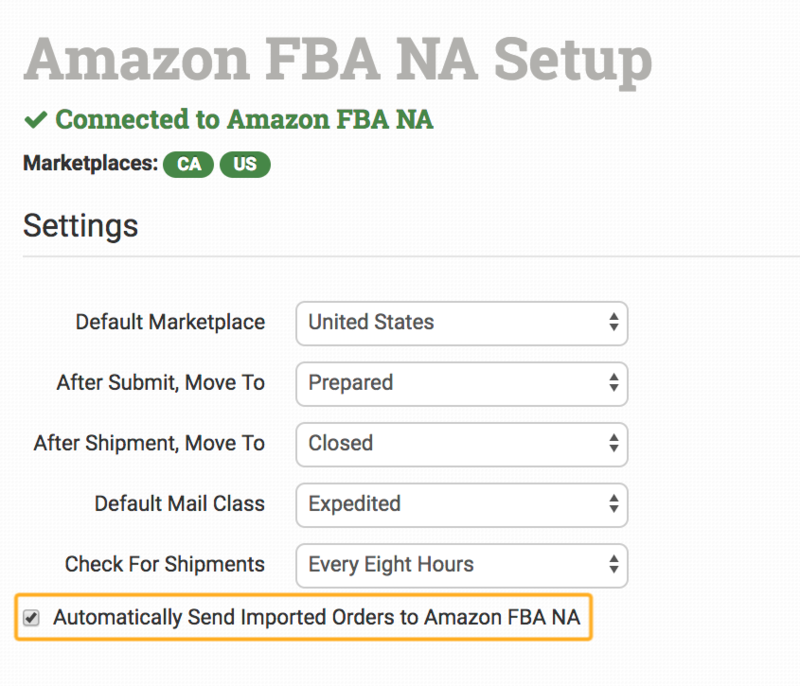 If you have an account with FBA, Order Desk can submit your Shopify orders as long as the FBA warehouse is in the same region as the shipping address on the order, and it adheres to the account settings you have with Amazon. Can I connect multiple FBA regions to the same Order Desk account? Yes. Each region is a separate integration within Order Desk. Connect to each integration as needed in one store. Why won't FBA accept my international order? If the shipping country on the order does not match the FBA region the order is being submitted to, FBA will reject the order. Make sure the order is being submitted to the proper FBA region. Please read the Send to Different FBA Regions section of this guide for detailed instructions. Why won't my Canadian order submit to my North American FBA account? Some older FBA accounts for the North American region do not include all of North America. If you already have the original FBA integration enabled and set up for the US, you can enable the FBA NA integration to log into and connect your Canadian FBA account, or vice versa. This also applies to Mexico. If you have three separate FBA accounts for the North American regions, you will need to have multiple Order Desk stores to connect to all three FBA regions. Please see the instructions in the Copy Orders to Different Stores section of this guide for instructions. Can I submit only orders to FBA that have inventory in stock and the rest of my orders to another fulfillment service? Yes. To do this, select Fill or Kill in the FBA integration settings for the Fulfillment Policy. Any orders sent to FBA with items that aren't in stock will be rejected. You can then set up a rule with the event When Order Not Submitted to Amazon FBA Because No Products Available. Add the actions to the rule that you would like to happen in this event, such as submit to another integration.